What I meant by the DS2 remark was "what weapons were used where" and not the size of The Deathstar. PTs have done very well in cracking both shields and armour - a couple of dozen were enough to overload the shields on one side of a Vic Star in The Bacta War. In the film, the shots are fired from the Falcon's blaster ports and I don't recall them acting as missiles in any fashion. I'll have watch the scene again to confirm though when I have the time. As to the PTs, put enough grenades next to a wall and the wall will crack. That doesn't mean that it's a better option then an AP shell. No they weren't, they were fired from the lower mandible. EDIT: after much squinting at YouTube, it looks like they were fired from between the mandibles rather than the lower one. They also have the appearance of an elongated blue cone with an orange tail - definitely missiles. A cone would indicate a PT rather then a CM or blaster. We could both be wrong then, I'll pull up the DVD tomorrow and get a closer look. Deepcrush wrote: A cone would indicate a PT rather then a CM or blaster. Given the resolution we're talking about, a cone could describe any modern missile. In any event a) it's far more elongated than the cone of a PT and b) we know they were CMs because the novelisation says so. Since film trumps novel, then what is shown there is what matters. If the fire is blaster bolts in the film then that's what it is. Deepcrush wrote: Since film trumps novel, then what is shown there is what matters. If the fire is blaster bolts in the film then that's what it is. Film trumps novel when there is an explicit contradiction. Since there's no such contradiction here, there's no problem. 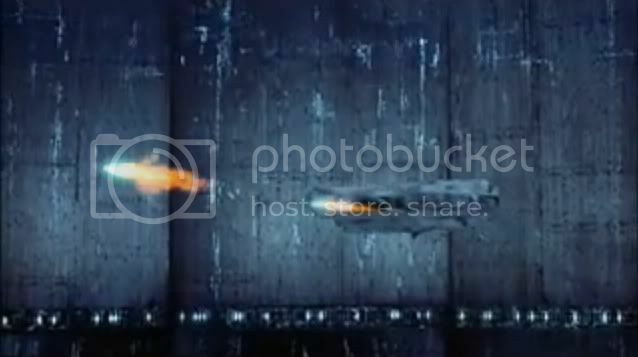 Where have you ever seen a blaster bolt that looks like a blue cone with an orange tail? They're all red or green streaks. Wrong, film always trumps EVERYTHING at all times unless GL himself declares otherwise. While the quality isn't as great as I would like, I did YouTube the scene several times from different sources. 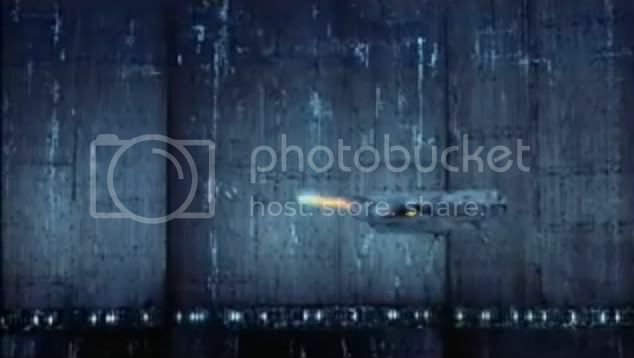 As far as I can tell, the fire is coming from the Falcon's main gun ports. Same location as the fire that she used to take out several TIEs earlier in the battle. The only difference is the point of view, inside it's a long body view and elsewhere it's an angled view. Looks to me that it's regular blaster fire. Wedge used a pair of PTs on the north tower and the Falcon put an 8 or 10 round burst of blaster fire into the center. Never did wedge declare he couldn't take out the center, never did Lando declare his use of misslies and finally the shots came from the main gun ports under the running lights. Unless Lando used only CMs for the whole battle, it looks pretty clear that it's not CMs in use. Deepcrush wrote: Wrong, film always trumps EVERYTHING at all times unless GL himself declares otherwise. Yes. When there is an explicit contradiction. Example: ESB novel says Yoda is blue. ESB film shows Yoda to be green. Conclusion: novel is wrong and Yoda is green. Example 2: ANH novel says the Empire has a million systems. ANH films says nothing about the matter. Conclusion: Empire has a million systems. 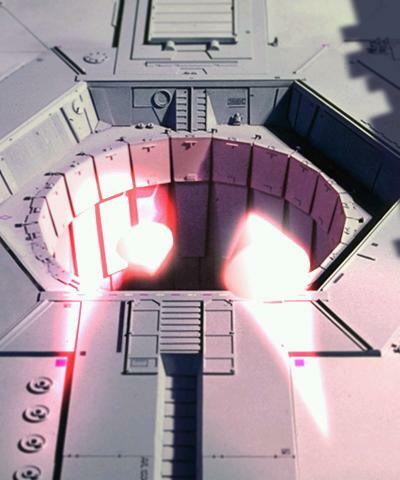 Example 3: RotJ novel says the Falcon fired CMs at the DSII main reactor. RotJ film does not mention what it fired, and visuals depict two elongated blue cones with orange tails, consistent with missiles. Conclusion: Falcon fired CMs. From here, we can clearly see that the weapons were launched from the cavity in the centre of the ship's forward profile. This image gives a better view of one of the weapons. As I've already mentioned, its appearance bears no similarity to any laser bolt we've ever seen. True enough, they come from the center of the ship between the gun ports and I have to concede that those cannot be bolt fire. That's an impressive capture to be sure. I'm still torn if those are CMs or PTs since the cone-cap is normally attached to the PT. Tough thing to decide on with a three inch screen. Deepcrush wrote: I'm still torn if those are CMs or PTs since the cone-cap is normally attached to the PT. Tough thing to decide on with a three inch screen. Judging by that image, the weapons are at least twice as long as they are broad, and that's looking at them from a pretty acute angle. PT cones, on the other hand, are about as broad as they are long, as you can see here.